The Bushnell Falcons are wide-angle optics, noticeable by their expanded lenses that are “wider” than most sporting optics. Wide-angle binoculars offer a wider field of view (FOV), meaning you can see more objects when looking into the eyecups. A common misconception is that increased DOF is the result of bigger eyecups or lenses. These binoculars function as multi-role optics but are more commonly seen among birders. 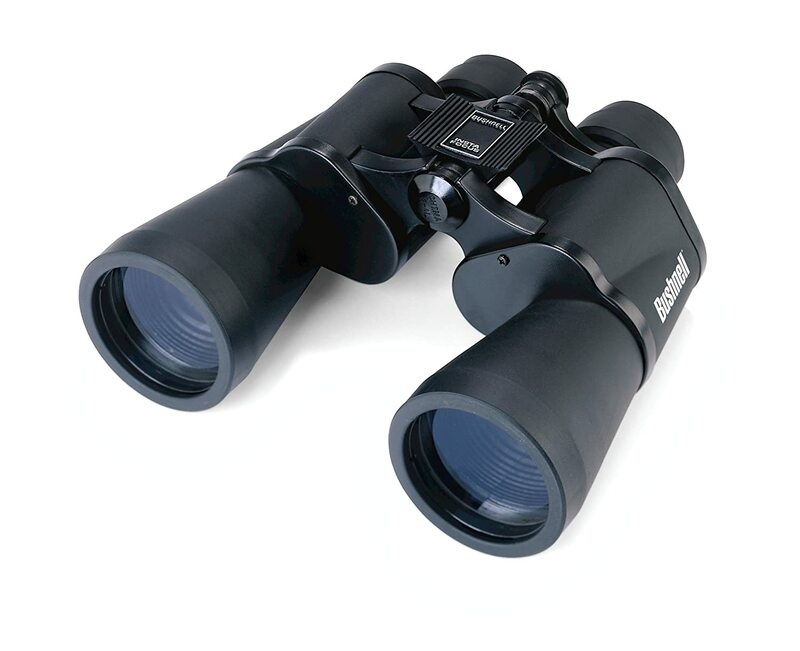 This particular pair of binoculars is 10x50mm, giving you increased magnification power. Combined with the benefits of a wide angle construction, the Falcon allows you to see more across the lenses while also giving you the power to see up close details. Range, depth, and magnification are usually sacrificed for one another, leaving few binoculars that shine in all categories. To be precise, at 1000 yards, the field of view is nearly 300 yards without magnification. One of the reasons why the Falcon is popular among birders is that it’s perfect for tracking fast moving birds or other animals. With a wider angle of view, you can spot and keep track of moving objects without having to swing your optics because it’s moving too fast. Magnification/Lens Diameter: 10x / 55mm. Field of View @ 1,000 yds: 300ft. You don’t see too many hunting binos with a wide angle style of construction. This is because hunting binos are focused on achieving recognition of an object at various ranges and then acquiring details about that object (color, light transmission, anti-fog, etc.). The Falcon’s wide field of view and ten times magnification still make it a versatile pair of binos, but it may lack in acquiring intense detail of objects and animals at maximum range. This set of binoculars work well for every outdoor activity that needs long-range optics. To the make the most of them, one has to think of them as more than just lenses to look through. Wide-angle binoculars have a broader FOV, even more so than some of the best sporting optics out there. That’s not to say that sporting optics aren’t flashy and provide great detail, but the key difference is that the Falcon is cheap. As with most binoculars, it comes with a focusing knob in the middle and diopter setting. You can spread the binoculars out and adjust the eyecups to your liking, making them personable optics as well. They would make great gifts for the holiday season because they are great quality and still have uses beyond birding. Click here to shop the Bushnell Falcon 10x50mm. Click here to check out the Falcon 7x35mm.